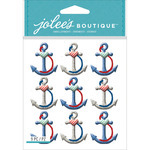 The same quality of Jolee's Boutique dimensional stickers, but these stickers give dimension without making lumpy pages! Stickers feature elegant touches of layered paper and textural accents. Sheet measures 2½"x6-7/8". These stickers are so awesome for lake or ocean layouts!